The project is currently in the preliminary design and environmental review phase. It is anticipated that the final design of the project will be completed in 2019, with construction taking place in 2020 and 2021. 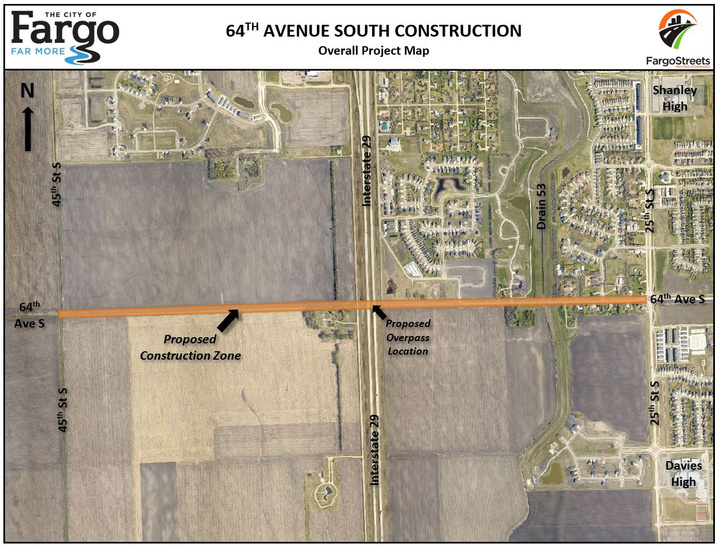 The City of Fargo, in cooperation with the North Dakota Department of Transportation (NDDOT) and Federal Highway Administration (FHWA), is proposing a roadway improvement project on 64th Avenue South from 25th Street South to 45th Street South. Please see the Overall Map above (or the PDF version in the Project Resources section) for additional location details. This project consists of constructing a new roadway, I-29 overpass, shared-use path, and storm sewer network along 64th Avenue South from 25th Street to 45th Street during the 2020 and 2021 construction seasons. The purpose of the project is to improve system linkage to allow for the safe and efficient movement of people and goods. The project is identified in transportation planning documents, whereby 64th Avenue South is anticipated to become a minor arterial roadway. The project is needed to improve 64th Avenue South between 25th Street South and 45th Street South to an urban section with bicycle/pedestrian facilitates to accommodate future growth of the City of Fargo. There are currently three build alternatives under consideration. All include a 3-lane roadway with differing pedestrian facilities. Please refer to the Project Resources section of this page for additional design alternative details. On Thursday, January 10th, 2019 the City of Fargo Engineering Department and KLJ Engineering hosted a public input meeting in order to answer questions and address concerns regarding this future project. Representatives from the City of Fargo, North Dakota Department of Transportation, and KLJ Engineering (engineering consultant team) were available to answer questions about the construction project. Stay current on project updates by visiting FargoStreets.com, where you can sign up for project email notifications. 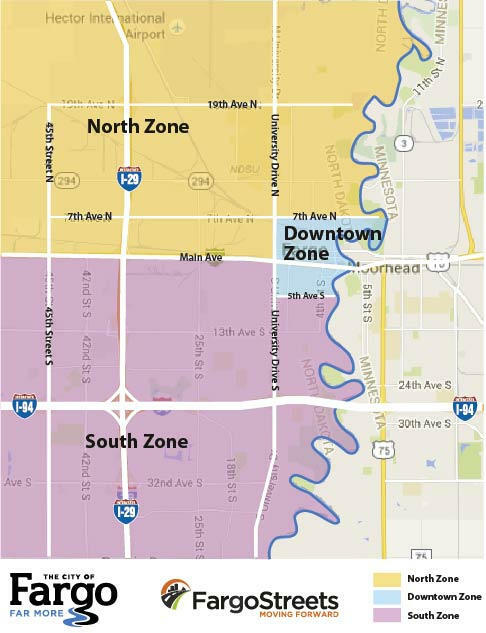 You can also follow FargoStreets on Twitter (@FargoStreets) and Facebook for up-to-date road related information.